Signal support systems specialists are responsible for battlefield signal support systems and terminal devices. Signal support specialists are part of the Army Signal Corps (USASC), which handles communications and information systems support for the combined armed forces. This job is categorized as a military occupational specialty (MOS) 25U. The USASC was established in 1860 and has played a role in all major military campaigns since the Civil War. It helped build the American telegraph system along the western frontier in the late 1800s. The signal corps is responsible for some of the biggest advances in radio signal technology, including Project Diana in 1946, which successfully bounced radar signals off the moon for the first time. The USASC used to have oversight of a much larger array of functions, such as weather forecasting, aviation, and military intelligence, but the modern-day USASC has a much more specific focus. 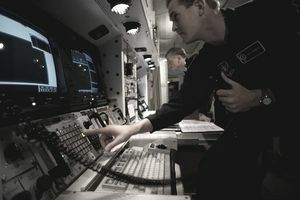 Obviously, in a combat situation, the jobs within the USASC are especially crucial to detect enemy signals and jam enemy radio transmissions, but in any scenario where large numbers of troops are moving, the signal support systems specialists are important to keeping everyone in contact. The job involves performing signal support functions and technical assistance for computer systems, providing technical assistance for local area networks, and doing maintenance on equipment, terminal devices, power generators, and vehicles. Recruits who want to qualify for MOS 25U will need a surveillance and communications (SC) score of 92 and an electronics (EL) score of 93 on the Armed Services Vocational Aptitude Battery (ASVAB) tests. To qualify to be a signal support systems specialist, recruits first need to complete 10 weeks of basic combat training (also known as boot camp) and 16 weeks of advanced individual training (AIT). They'll divide this time between the classroom and the field, and will receive the training at Fort Gordon, Georgia, from the 369th Signal Battalion. During training, these soldiers will learn mechanical and electrical principles, preventive and maintenance procedures, communication security policies and procedures, and line installation and wiring techniques. Good problem-solving skills and an interest in working with electronic equipment are necessary traits for those soldiers pursuing the MOS 25U job. Normal color vision (no color-blindness) is required, and recruits must be U.S. citizens. Soldiers in the MOS 25U work with all manner of electronic devices, including communications equipment, vehicles, radio and wire systems, and power generators. Good problem-solving skills and an interest in electronics are necessary traits for those soldiers pursuing the MOS 25U job. You'll be qualified for a variety of civilian jobs with the training you'll receive as MOS 25U, including radio mechanics, radio operators, mechanics, installers, and repairers. This job is good preparation for a post-military career as an electronics technician.